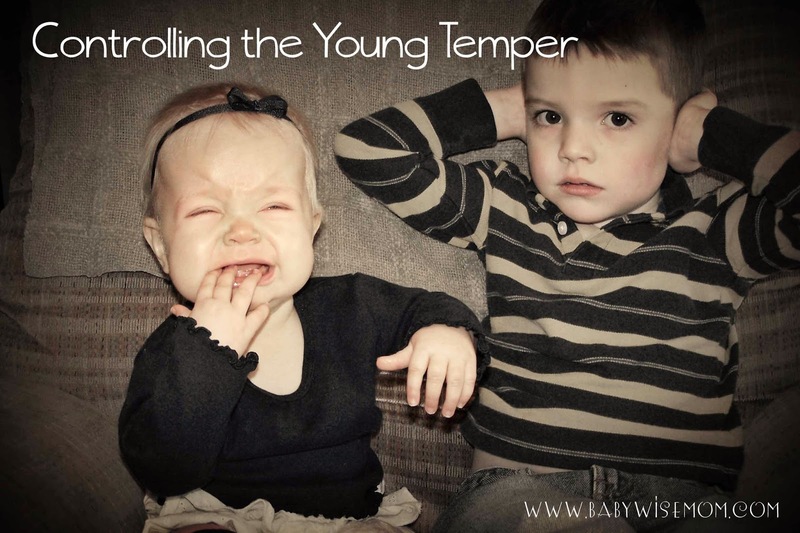 Controlling the young temper tips. What to do when your young toddler has a tantrum. I recently wrote about how Brayden (now 3) had a short fuse when he was about 14ish months old. I had a question about more details on what I did to curb that, and I thought it warranted a post all to itself. To refresh, when Brayden was about 14 months old, he really started to show his impatience with accomplishing tasks. He is a complete perfectionist, and for him to try to do something and not get it perfect immediately was the ultimate frustration for him. He would immediately get mad and start to cry. Although I have never seen such a reaction from my husband, I know he is the same way. I call it being a bit of an irrational perfectionist. I myself am also a perfectionist, but I completely understand the fact that you must put time into something to get really good at it, much less perfect. As a child, my husband would draw a picture, crumple it up, throw it away, and start over. His teacher and mother found out it was because his picture was not turning out how he wanted it to in his head. I wanted to teach Brayden how to control his emotions and also teach him the proper expectations for life. This might sound like a weird expectation for that young of a child, but I was sure he could do it. I don’t think this frustration is limited to the “irrational perfectionist” or those with a short fuse. Kaitlyn (now 16 months) displays a similar behavior on occasion. She is also a perfectionist, but one who is willing to work and work at it until she gets it. Her frustration comes after working at the same thing for 20 minutes without success rather than 20 seconds. Never-the-less, if my sweet little Kaitlyn can act that way sometimes, I can see it being something all toddlers do at this age. The number one item that helped him with his temper was teaching him sign language. Because he was such a verbal child, I didn’t even think about teaching him sign language before that. His first word was at 8 or 9 months. I didn’t think he needed help. However, I think a lot of frustrations that happen after your little one hits a year old up until communication really starts to take off through sentences and the like is due to the fact that they understand a lot, but cannot even begin to communicate anywhere near to it. Some are more willing to try, but they just physically cannot say all that they know. I used signs to teach Brayden how to communicate words that really helped him express his needs in these frustrating times. The main word for him was “help.” I taught him that instead of throwing a fit, he needed to ask for help. That was the biggest help in diffusing the little temper. Instead of the fit, his energy would go into signing help. This has been unnecessary with Kaitlyn. She already knows sign language, and she already speaks simple sentences. My next tip is the biggest help with her, and was also a huge help with Brayden. Encouragement. I would and do tell my kids, “Keep trying!” in a really happy, positive manner. If it is a toy that is beyond their years (which can easily happen with Kaitlyn since we own toys beyond her ability), I take the toy away. This is not as punishment, just as a favor to the child. If the toy or skill is age appropriate, I tell them to keep trying and give encouragement as they work on it. Kaitlyn hears “keep trying” and happily replies “Kay” and keeps trying. Brayden would remain frustrated, try, fail, show more frustration…I just had to be the voice in his head that said keep trying! When he did it, I would say, “See, you kept trying and you did it! Good job honey!” I would also explain to him along the way that it takes lots of practice to get good at things and you have to keep trying. These days he is his own voice in his head (or maybe he hears mine 🙂 ) and keeps trying. Another thing that helped was independent playtime. As I have mentioned, we gave up independent playtime for a few months and reinstated it around 13 months. I tend to hover and swoop in to help my struggling child before they really have a chance to get it themselves. Independent playtime required Brayden to get it himself. I also made an effort while we were together to give him a chance to do it himself. Discover the reason for the temper. 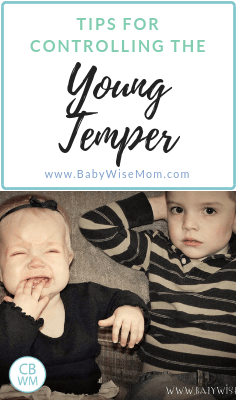 Why is your toddler losing his temper? What circumstances bring it on. In Brayden’s case, it was his lack of ability to do something perfectly. Think of ways to prevent or stop the temper based on the reasons. In many cases, no matter the reason, ability to communicate is going to help prevent break outs. If your toddler is losing his temper when he doesn’t get what he wants, reflect on your own behavior. Do you give in to these fits? Think through solutions. Give it consistency and time. You are teaching your child how to control themselves. It is hard enough for many adults to do this, so don’t expect things to be fixed with your first attempt. I could really use some advice on my 13 month old's temper.He has just recently begun throwing tantrums when he gets taken from doing something he wants. His tantrums consist of throwing himself back, hitting his head on whatever is around him (me included), and biting. I feel he is doing these behaviors out of frustration. Not because he really wants to hurt me. He is just learning to walk (but he crawls mostly)so it tends to happen when I give him some freedom to roam, but then take him away when he goes somewhere unsafe or he begins to get into things he shouldn't, or maybe he begins to crawl and I don't want his hands on the floor. It seems like he is discovering that he has some independence and when I don't let him have it, he breaks down.How do I react to this? Maybe I'm giving him too many freedoms too early. But when we are in a public place, I'd to let him roam a bit but be able to get him when I need to without throwing a fit. I guess I'm looking for advice on how I should prevent it if I can, and if he goes into his fit how should I react? The biting really bothers me. It's so embarrassing in public and makes me feels like I'm a terrible mother who has not taught her child well! LEM,I would review biting in toddlerwise. It does sound like there are too many freedoms here. When the child reacts to restrictions like that, it is usually because of more freedoms than he can handle. Choose a battle plan and then be consistent with it. I would choose something you can do in public also, so he knows he can't ever get away with it. Perhaps it is isolation. Perhaps it is having to sit in your lap for X amount of time. My son is 14 months old and has started to have little tantrums. I really need help on what to do with him. Each time I pick him up to put him in the high chair for his meal, to go in his play pen for independent playtime, to put him on the changing table to change his diaper, to take him upstairs to put him down for a nap he completely arches his back, screams, and tries to wiggle out of my arms. It is so frustrating.. especially when I am trying to walk upstairs with him doing that. I have tried to tell him No! but it only makes him react stronger. I know that a lot of it is just that he is frustrated because he wants to play or crawl and I am taking that away from him. But, it has gotten out of hand. What am I doing wrong? How do I correct this behavior if No! makes him even more angry? I know a lot of the time it is that he sees his toys and wants to play with them, should I put his toys in an unvisible place? Please help me. I find myself reacting to him in frustration and I really want to know how to calmly stop this behavior.Thank you so much! Kim,I would do some compromising.First, I would give him warning before something is going to change "In a few minutes, it is going to be time to stop playing and change your diaper." Second, I would choose some things (or one thing) he gets to travel to himself. Perhaps he gets to crawl to his room for a diaper change. Third, in some situations, offer distraction. For diaper change, give him a toy to play with.Fourth, I would say, "I know you want to keep playing, but it is time to sleep now." Be gentle and be patient. This isn't something that will go away overnight (unfortunately 😉 ).